Clark Alexander joined with a team from UGA to help educate Rhode Island Senator Sheldon Whitehouse yesterday about coastal issues. Whitehouse visited Ft Pulaski here in Savannah and then traveled to the UGA Marine Institute on Sapelo Island as part of his Climate Road Trip through NC, SC, GA and FL. Whitehouse is immediately in front of the statue in the second row. Clark is second from the left in the blue shirt. 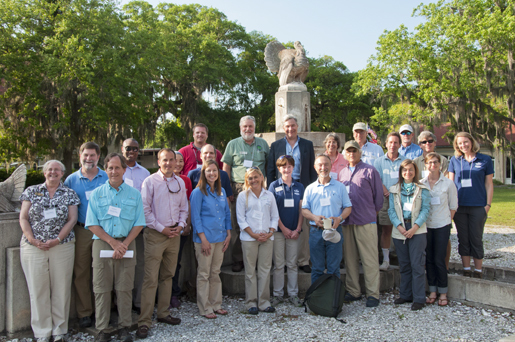 Senator Whitehouse on Sapelo Island with Clark Alexander and group from UGA.